Evalon is a well-established merchant services company that works to provide small businesses the ability to expand and capitalize on business opportunities. Their services allow businesses to accept payments in a myriad of different ways. The main initiatie of Elavon’s business model is to provide payment processing services for small businesses allowing for the furthering of each business’ goals. 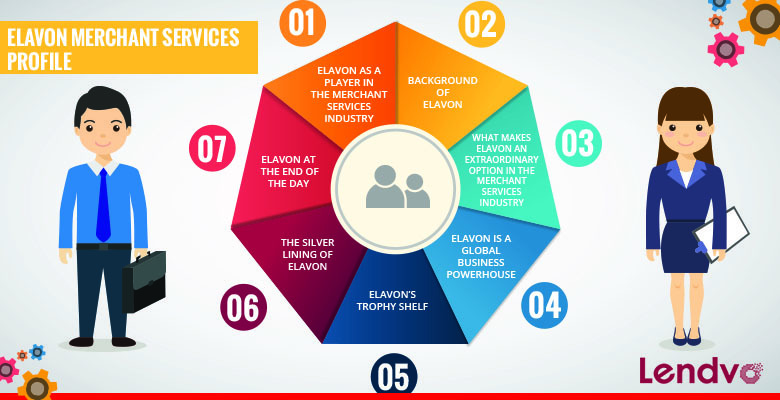 Elavon’s payment services do not solely focus on the exchange of money between a merchant and a bank via credit cards and debit cards, but what really draws them apart from other merchant services companies is the variety of options they offer to small businesses to make their business transaction process seamless. Elavon holds headquarters in Atlanta, Georgia. The business was established initially in 1991 with the business name of NOVA Information Systems. Later on, in 2008, they merges with euroConex re-enterining themselves into the business place as Elavon and as a part of U.S. Bancorp, better and more commonly known as U.S. Bank’s payment services division. Elavon has been in the merchant services industry for two and a half decades. The 25 years of experience Elavon has under its belt has affected over one million customers, which are businesses, around the globe by allowing these small business owners to run their businesses more efficiently and produce more business. The growth experience by these small businesses has been supported by Elavon because of their continued ability to provide new and secure payment solution options all the while adapting to the transforming the landscape of ways business has been conducted as the business landscape has and continues to change. Elavon assists businesses, many small, but large businesses as well, to accept any payment types that they choose to. Complicated payment solutions are offered in addition to simple solutions depending on the style of the business owner and needs of the business. Yearly, Elavon has been rated as a top five global payment provider processing upwards of 3 billion transactions with value upwards of $300 billion. The payment tools recommended and provided by Elavon are state-of-the-art in addition to being customizable depending on the industry a given business exists within. Their help desk is amongst the top-tier and most respected of all merchant service industry-based companies according to expertes in the field. Specialists are available to speak to clients 24 hours a day, 7 hours per week and headquarters are in 10 contries. U.S. Bank backs the services Elavon provides and they are the fifth largest commercial bank in the United States. Globally, Elavon is recognized as the leading payment solution provider for airlines. The proof-of-stability in their business partnership with airlines is that airlines process a massive amount of business transactions daily, monthly and annually proving Elavaon’s reputability. The pace of global change taking place in the consumer and technology adoption are forcing the business landscape to change and grow faster than ever. Elavon is speerheading the payments industry with innovation and keeping up wit the time as the landscape moves forward at a rapid pace. The commerce-driven approach of Elavon is speerheading the business landscape as they acquire more and more global customers with their flexible and customizable payments solutions not only for airlines, but as a top five payment solutions provider for education, retail, public sector, healthcare and hospitality businesses. The engineers that work for Elavon have extremely unique and specialized experience making them the best option for any business you own, worth with or for. To convey the globality of Elavon’s practices, here are the states that the service has offices in North America: Atlanta, Georgia; Knoxville, Tennessee (headquarters), Denver, Colorado; Minneapolis, Minnesota; Toronto, Canada; Oakville, Canada; Pleasanton, California. In Europe, they are headquartered in: Arkolow, Ireland; Dublin, Ireland; Frankfurt, Germany; Oslo, Norway; Warsaw, Poland; Madrid, Spain; London, United Kingtom. They also have a lesser, but a presence nonetheless in Latin America in Mexico City, Mexico; Queretaro, Mexico and Sao Paulo, Brazil. This trophy was awarded to Elavon giving them critical acclaim at the European Top Industry Leader Awards ceremony which was conceived by the Cashless Payments Development, a payment industry body: this foundation promotes contemporary forms of payments. Rafal Golebiewski received the award eDukat2016 for Personality of the Year while the Elavon team in Poland of 600 people was given the Top Industry Leader Award. They acquired three-fold revenue for almost 20,000 customers and the award pays tribute to the methodology used by top payment companies. This award is sponsored by Visa Europe and Visa Europe Collab; it pays tribute to the organizations and businesses working to further global acceptance for NFC technology and contactless. This award was for Elavon’s “Cork Cashes Out” campaign which won over all the global competition in its field for its strength of character and fordmidable determination it expressed during its campaign. The Contactless and Mobile City Initiative award won since Cork grew 2% more in card transactions than the national average with a year-over-year iincrease in total card transactions of 17% while Ireland’s overall increase was 15%. The project spanned three months during the fourth quarter of 2015 and worked to promote Cork as Ireland’s first cash-free city. They did this by showing consumer benefits by using electronic payments and showing how easy it was to use in addition to being secure. The CSOD Award was given to Elavon for their HR and talent strategy that is used in more than 191 countries by over 2,700 businesses. The clients include some top businesses including Ricoh, Walgreens, Turner Broadcasting including Starwood Hotel & Resorts. The RAVE award which stands for Remarkable Achievements and Visionary Elities and was given to Elavon for its Talent Management System which assesses talent in various organizations. U.S. Bank is integrating Elavon’s platform currently migrating it into its practices. The home to American Business awards provided Elavon this honor for their role in the public sphere. The esteemed business has contributed positively to working professionals around the globe. The esteemed businsesses that preceded them in receiving this award were Cisco Systems, Accenture, Dell and AT&T. This award was given to Elavon for its software solution which minimizes cost association times for businesses that are transforming to become EMV-compliant. Elavond oes not necessarily cater to small businesses because of its flat-rate pricing so the larger companies that have won similar awards to Elavon show that they are a big player in the merchant services industry and although some small businesses do use them, they won’t fail without those smaller businesses. Additionally, the fact that they offer a flat-rate pricing structure is an immediate red flag for smaller businesses. Yet, an upside is the fact that they do not charge an early termination fee or provide monthly contracts. There are certain reviews out there that are concerning when it comes to Elavon’s EMV compliance and as a small business owner, one should be sure to scour the internet for whatever details may be out there. That being said, the Better Business Bureau has rated Elavon with A+ despite almost 200 complaints being filed against them. The BBB notes that Elavon has been responsive to the complaints they have been faced with. When Elavon takes on a new client or merchant, as a payment processor, they are taking on a risk in the case that the merchant begins to go about their business in a way that was not agreed upon in the contract between Elavon and said merchant. Elavon is allowed to note any high-risk merchants to the BBB. Their flat-rate mobile offering is inclusive of a $10.00 monthly account fee, but allows for an easy transfer to a full merchant account at the point a small business grows to be able to take on that sort of financial responsibility. Contacting corporate sales will allow you to get the best possible deal for your small business. There is a PCI compliance fee of about $99 each year for using Elavon’s service which is along the lines of most other payment processing providers. The terminal leases are said to bea bit overpriced becaue the company works with Ladco Leaseing terminals which is known in the industry for not allowing its clients cancel the four-year leasing terms which are said to cost thousands of dollars during the lease between said merchant and Ladco Leasing. That being said, customers say Elavon does not hit them with hidden fees and that they offer a variety of pricing models to their customers. Contracts are required annually. If a merchant is to cancel their contract before the first year fees are $295. If merchants cancel before the second year, fees are $195 for cancellation fee. For Terminal Offer contracts there is a $10.00 monthly charge, a one-time fee of $4990..for one Ingenico iCT250 Terminal and charges for Card-present transactions are 2.65% + $0.19 per transaction with charges of 3.5% + $0.19 per transaction for Card-not-present-transactions. At the end of the day, purchasing this for the right business is more cost-efficient than leasing a terminal if a business plans to use it long-term. The Mobile Offer contracts include the $10.00 monthly account fee, a much smaller charge than the Terminal Offer for smaller businesses for the one-time device fee for the processor at $24.99. Card-present transactions and Card-not-present transactions are identical to Terminal offerings. The payment gateway and virtual terminal is a proprietary payment gateway called Fusebox. Authorize.Net is also also available, but the pricing is not available online. The mobile processing comes through the Converge Mobile app and can be found on iOS or Android with enabled pin readers through bluetooth or PIN pads. These are only available in the United States. The tablet-based mobile POS system is partnered with Verizon on the 4G LTE network. The POS system is user-friendly and their online reporting service is Merchang Connect which is high quality. There are merchants that resell the Elavon services, but as mentioned earlier we highly recommend goin through their corporate sales system. Elavon prides itself on being highly secur with its EMV sand encryption services. They protect payment data so small business owners can focus on running their businesses. The site is user-friendly and the integrated security solutions protect busnesses allowing for smooth and quick processing for all transactions that small businesses face either dealing with mobile or terminal processing. The services work through Safe-T for small and medium-sized businesses alike. Safe-T prides itself on offering a multi-layered approach to deal with the evolving secuirty threates that small business owners face from hackers on a daily basis. At the end of the day, Elavon is a top five merchant payment processing service and their usability on terminals and through mobile makes it hard to recommend another service either for larger businesses that are using terminal offers or for smaller businesses starting off on mobile that may transfer to use terminal processing later. A lot of companies find themselves using both at the end of the day. The safety in security and longevity as a payment processor allow us to highly recommend Elavon to all of our small business customers in addition to their usability and availability as a global payment processor and their adaptability to market changes.